When Salesforce announced their ChatterBox content collaboration solutions a couple of weeks ago, the one vendor most impacted by the news was Box – partly because they’d previously been an important partner of Salesforce, but also because the announcement cut off some of Box’s oxygen, especially inside companies who are already heavy Salesforce users. This morning we saw Box CEO Aaron Levie make some announcements that indicate how they’re responding to this threat and, as expected, they revolve around positioning Box as the ultimate Switzerland in content collaboration, the one neutral player who will work with all vendors. First a recap – Box sees their role as one of enabling the Discover, Connection and Engagement around content. In a pre briefing yesterday, Levie explained how the post PC era sees a massive increase in people connecting via phones and other mobile devices – to back up this claim about the move to mobile, over 140000 businesses, 14 million users and 92% of the Fortune 500, over 50% of the traffic that Box sees comes from mobile devices. The Box thesis is that, in this newly decentralized and heterogeneous world, content is the central core of an organization and that all else revolves around that content. The announcements all aim to enable that to occur. Of course all this requires both an ecosystem and visibility in the marketplace, a point alluded to in the briefing, Ray Wang from Constellation research Group when he asked how Box can align itself with industry players to create some momentum and visibility to compete with traditional players. 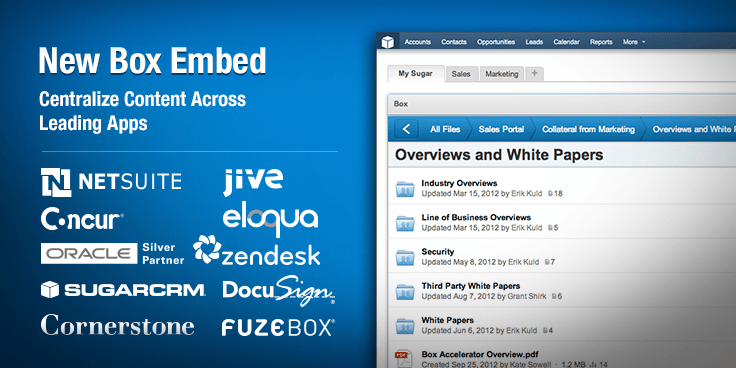 Enter Box Embed – Box Embed is a new HTML5-based embeddable framework that puts the Box content and collaboration capabilities within third party applications – at launch, Box Embed is being adopted by ten different SaaS players; Concur, Cornerstone OnDemand, DocuSign, Eloqua, FuzeBox, Jive, NetSuite, Oracle, SugarCRM and Zendesk. Partners simply provide an iFrame within which the Box content is displayed – Box Embed allows around 95% of Box functionality within the partner application. Box Embed sees Box try and position content as the central core of differing enterprise applications. Using the framework, within the third party applications users can preview, comment, task and search across the content stream. Store once, but access anywhere is an attractive idea – by allowing (for example) NetSuite to focus completely on building out the strongest financial application, the theory goes that the solution delivered is better than if NetSuite were to also look to build a content collaboration tool as well – in theory customers should be able to get a better financial system AND a better content system – it’s the very reason for best of breed as opposed to getting everything from one vendor. And in articulating that value proposition Box is taking swift kick at Salesforce (not to mention Oracle, SAP and other more “legacy” vendors). Levie made a thinly veiled comment on the risks of having content with one of these broader players when he warned that content is becoming siloed and that users are best served by independent solutions for their content. He raised concerns over a product like ChatterBox that is centrally focused on Salesforce products, and suggested this was a risk for organizations using solutions other than those from Salesforce. This concern has validity – while Salesforce used similar messaging about ChatterBox, suggesting it was the honest, neutral and independent broker – there is quiet concern that ChatterBox will be more of a walled garden and will do some more to try and keep organizations within a tightly walled silo. It was interesting to talk about the announcement of ChatterBox with two Box customers in the briefing session – I asked both whether the advent of a combined social and content product from one company would lessen the appeal of a “best of breed” approach. Both tended to lean on the fact that, when their buying decisions were made, no credible content management solution existed from a player with a deep social presence. One of them indicated that “if they [Salesforce] had decent functionality two or three years ago they would have beaten Box to the punch”. Suggesting that the road ahead for Box won’t be quite as smooth as it has been to date. The customer did moderate their statement somewhat by explaining that their company has deeply bet on a best of breed approach and that, in his opinion, the cost of integrating best of breed solutions is worth the effort to get the better specific functionality that best of breed solutions tend to give in comparison to suite solutions. In a discussion with Chris Yeh, head of Platform at Box, I asked about an emerging trend where end users will interact with Box content while having no exposure to the Box user interface itself – Yeh concurred, roughly a third of all Box API calls that occur come from third parties – and this quantity is growing. Yeh foresees a day when more people interact with Box content outside of the application itself than in it. This raises some interesting opportunities around white labeling of the Box product (and, perhaps, a now departed opportunity of Salesforce partnering nicely with Box to create a solution). It is my belief that these sort of discussions around white labeling have occurred in the past and continue to do so – the real challenges aren’t technical – they’re in ensuring the commercial arrangements are solid for all parties. All very interesting stuff… Anyway, in terms of pricing and availability, both NetSuite and SugarCRM will be launching Box Embed this week and the other partners later in the quarter. Box Embed will be available at no cost to users of both Box and the corresponding third party application. It’s an interesting proposition, best of breed vs part of a suite. Without knowing exactly how box embed works I may be missing the point but I’d counter by saying how important context is. Files need to be located with the relevant records, and contain contextual references, rather than on an island of content, this is the same argument that sees chatter work change collaboration where something like yammer falls short, chatter posts are contextual to records in the system, yammer posts are over there somewhere on an island. Folder structures are dead IMO files need to be where they are relevant not in a folder structure that might work for one user but not another.